The concept behind writer/director Justin McConnell's latest horror movie is fantastic: a guy with the ability to shapeshift by killing his victims, goes on a murderous spree in an attempt to rekindle a relationship with the woman he loves. It seems that McConnell's Lifechanger does offer up a reason as to why the shapeshifter needs to change bodies so many times but it seems what's most notable of the movie is that at just shy of 90 minutes long, it moves quickly; "Even the gore is efficient." 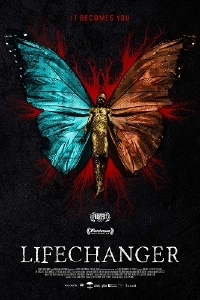 Lifechanger stars Elitsa Bako, Lora Burke, Jack Foley, Sam James White, Steve Kasan, Bill Oberst Jr. and Rachel Vanduzer. It's a great idea and though the trailer suggests a fairly low-budget production, the gore effects look pretty great which, in combination with the batshit crazy plot, have me intrigued. Lifechanger premiered at Fantasia and spent most of 2018 making the genre festival rounds and is now available on iTunes.